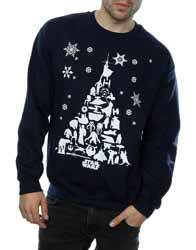 Absolute Cult has a number of different themed jumpers available this year. The pop culture inspired festive wear includes a selection of TV, music and film variants all designed to give a nostalgic retro feel. 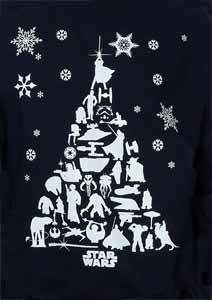 We were sent the Star Wars Christmas Tree themed jumper which has a number of Star Wars characters, vehicles and creatures in silhouette laid out to look like a Christmas tree from a distance, with the Star Wars logo at the base of the "tree". They come in a choice of three colours (burgundy, navy blue and red). You can also opt for child and adult sizes as well as male/female variants. The quality is as you'd expect for the price and the material (90% cotton, 10% polyester) retains body heat well for those long winter nights. In fact, as I'm typing this review, in our freezing cold office, I'm leaning on it (so that I can read the label as well as examine the quality) and it's actually warming my arms quite nicely. Because it's of subtle design, it's the perfect gift for that Star Wars fan that doesn't like to boldly advertise the fact they're wearing a Star Wars themed jumper. It's one item you can put away after Christmas and look forward to unpacking every year.